The broad aim of this book is to provide a general basis for comparatively analysing and understanding the French riots of October/November 2005 and the corresponding Bristish disorders which occurred in the spring/summer of 2001. The first of the French riots broke out on 27 October in the north Parisian banlieue (suburb) of Clichy-sous-Bois when two teenage youths of Muslim heritage were electrocuted in a substation while fleeing from the police. The two youths had apparently become unwittingly involved, together with their friends, in a police investigation of a break-in. It is not clear whether they had actually been chased by police officers. Nevertheless, a rumor to this effect quickly circulated the locality, provoking violent confrontation between youths and police. Three more weeks of rioting then ensued in neighbouring Parisian suburbs and other major French cities with similar concentrations of ethnic minorities. The riots invariably involved thousands of youths from poorer areas who confronted the police, set fire to local buildings and ignited hundreds of motor vehicles. Further rioting - though not on the same scale as in 2005 - occurred subsequently in 2006 and 2007. England and Wales have had their own counterparts to the French riots. In the early and mid 1980s, there were a number of clashes between police and African-Caribbean youths in inner-city areas. Further, in 2001 rioting broke out in the northern mill towns and cities of Bradford, Burnley, Leeds and Oldham. All of these later instances involved youths from Pakistani or Bangladeshi descent. In contrast to the riots that occurred in France though, a contributing factor to 2001 riots was the activities of white neo-Fascists. Many official reports and academic studies followed each wave of disorder, each questioning the effectiveness of Britain's 'multicultural' society, in addition to other possible factors such as the marginalisation and 'criminalisation' of minority ethnic youth, and their relations with the police. Such issues were again on the agenda after more rioting occurred in the Lozells area of Birmingham in 2005. Unlike the previous disorders, this entailed conflict between South Asian and African-Caribbean youths, following a rumor that a young African girl had been gang-raped by South Asians. British attempts to analyse and remedy the underlying causes of the riots constitute a potentially valuable resource to French academics, practitioners and policy makers. In turn, the French experience provides a fertile basis for re-applying, testing and enhancing existing British theory and policy. 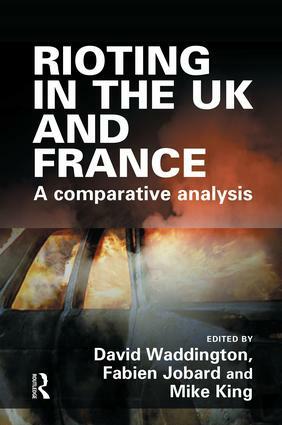 The book consists of a highly coherent, theoretically rich and thematically comprehensive collection of papers which provide an unparalleled description and comparative analysis of the French and British riots, along with social policy recommendations to help to address the underlying issues. The French police and urban riots: is the national police force part of the solution or part of the problem?